Description: BNSF 4075 and 4651 surprise leaders of Q55120 today. Description: Part of the power for the Tulsa OK to Fort Worth (North Yard) TX high quality manifest. Description: BNSF 4075 serving as a pusher on an all-KCS black hopper consist. 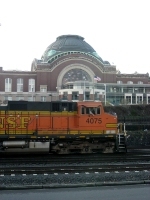 The train was northbound, but an engineer in this pusher engine moved the train south to clear the main for another northbound freight - a BNSF powered train of empty coal gondolas. Description: Q381 westbound at Buffalo-Depew Station. Description: BNSF's MDYICJ-25(Manifest Dayton, TX-Illinois Central Connection New Orleans) comes off the Huey P. Long Bridge.